Ahhh…the life of an islander. What a dream come true. No cell phones, no boring office jobs, no…er…clothes. Who wouldn’t envy the little island people of Island Tribe 3. 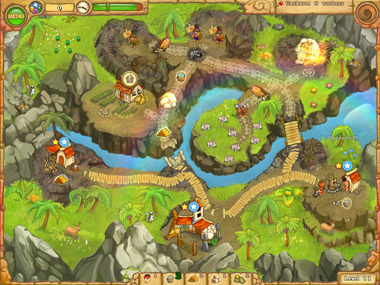 After making a wish in front of the Altar of Wishes, the small, tubby clan of settlers are sent back to their home island. The great volcano is dormant again and the tribe is free to frolic in the beautiful nature, live carefree and enjoy perpetual peace. The only challenge the island people have is to rebuild their homes, which were in ruins upon their return. That’s where you come into the picture! It’s your job to build and fix the roads, bridges and new buildings, put out fires, protect the village from bears and fill the role of general handy man/woman of the area. Now this is a Time Management game, so you must accomplish all these tasks before the clock runs out, unless you decide to play in Relaxed Mode and take more time to enjoy the levels and the adorable graphics. Aside from the hard work on repairs, the islanders live in quiet harmony. It’s only natural for new love to flourish in perfect conditions like this. The leader of the tribe falls head over heels in love with one of the girls of the clan and they decide to marry. Here’s where the plot thickens – the wedding must take place in an ancient temple, only the doors are locked. To open them, the islanders must find pieces of ancient runes dispersed across the island. Being so immersed in their mission to find the runes, the island tribe is unable to stop an evil shaman from kidnapping the bride! So now you’re more than just a repairer, you’re an island explorer and special investigator. All the happiness and safety of the tribe leader and his bride depend on you. Can you make their dreams come true? 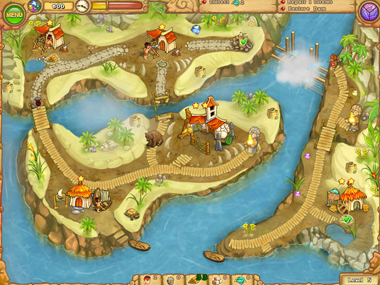 Island Tribe 3 is a good game for anyone new to Time Management because the directions are really clear and straightforward. Just like Island Tribe and Island Tribe 2, you travel around the island collecting items, making repairs and chasing animals. Cute new additions include saving rabbits and sailing to other islands. There are loads of levels that you can return to and play again until you master them. I love all 3 of these Island tribe games. 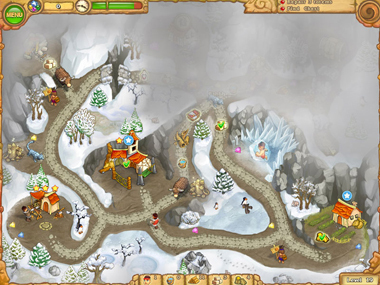 if you don’t chose the correct path you won’t beat the time or find the special hidden tokens. Challenging but doable 7 you canalways replay any level you’ve fluffed. PLEASE UNSUBSCRIBE THIS ‘FREE RIDE GAME’ PAGE FROM MY COMPUTER IMMEDIATELY! games from FreeRide almost messed up my laptop!! !